I usually don’t have too much to say about afternoon tea sets, as it is difficult to find pastries, cakes and scones that taste very bad. Afternoon tea at luxurious hotels are pretty much failsafe, so in Hong Kong, you could count on places such as Cafe Causette at the Mandarin Oriental, The Lounge at Four Seasons Hotel and The Lobby at the Peninsular; the only problem? These places are absolutely heaving in the weekends! This is why I decided to give Harvey Nichols Fourth Floor Restaurant a special mention in my blog. I have been there for lunch and dinner a few times, but the food was not remarkable and the meals were pricey. The “modernistic” décor of this restaurant is not favourably received by Hong Kongers – many people have expressed their dislike for the restaurant’s long and narrow space, and the sharp contours, grey tones and zigzag arrangement of tables are not conducive to a relaxing, cosy atmosphere. However, the saving grace of Harvey Nics Fourth Floor Restaurant is that it is an ideal place for afternoon tea in the weekends. Firstly, despite its central location in the Landmark, you will be able to find a table in the weekends without a booking. Secondly, the tea set actually tastes quite good! N, E and I were supposed to go to Woobar (W Hotel) for tea on a Saturday, but we could not bring our lazy selves to West Kowloon, so we settled for Harvey Nics at the last minute. The sultana scones were nicely buttery, without being dry. The foie gras mini baguette, spinach tart and mushroom and chicken pastry were also scrumptious nibbles. As for the tea pastries, the fresh blueberry tart was a mini bundle of delight, and the lemon macaron was sweet with a lovely citrus touch. 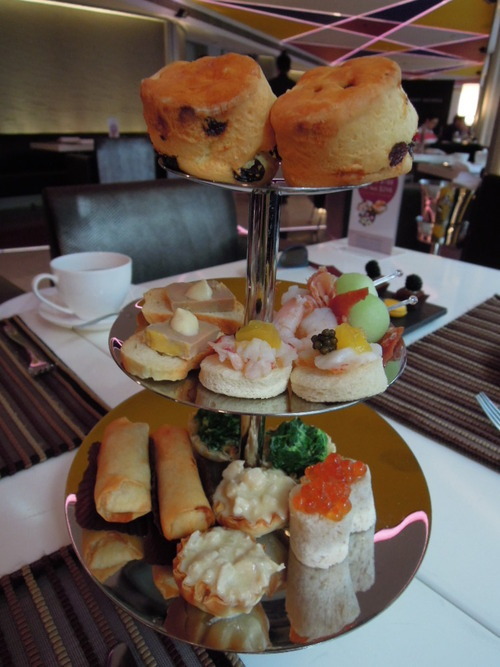 Dear Hong Kongers/ readers, what is your favourite place for afternoon tea in Hong Kong? Does that place have an impossible waiting time in the weekends? 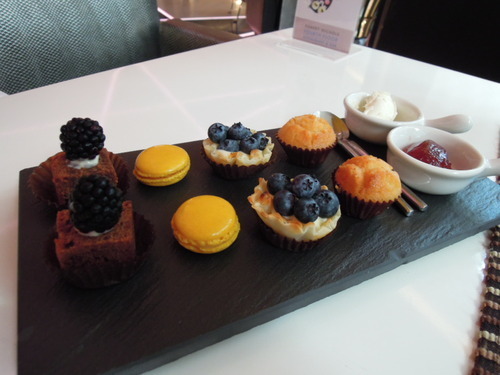 If you have tried the tea set at Harvey Nics Fourth Floor Restaurant, what do you think about it?